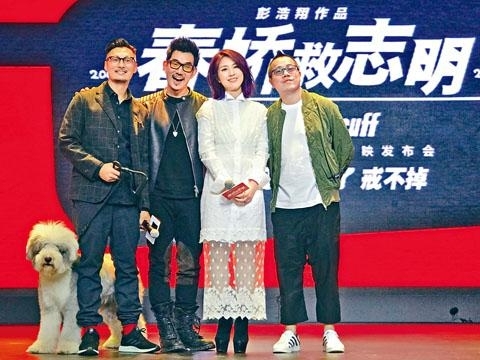 The film LOVE OFF THE CUFF (CHUN GIU GAU JI MING)'s Shawn Yue Man Lok, Miriam Yeung Chin Wa and director Pang Ho Cheung promoted all over. Yesterday they went to Beijing. Richie Jen (Yam Yin Chai) made a surprise appearance. Yue Man Lok's godmother Jiang Mengjie also showed her support. Yue Man Lok demonstrated the fitness ball and made Mainland fans screamed. In addition, in the film Cherie wore a nurse costume to seduce Jimmy. Chin Wa flirted with Yue Man Lok with props like a needle and a stethoscope. Later Yue Man Lok embraced Chin Wa from behind.